We are almost at the end of this adventure with Anna Volovodov and that makes us sad since there will be months without a weekly dose of Elizabeth, but at the same time we’re happy with the development of the character we get to have in the latest episodes. This second part of the season (since Anna was on the Thomas Prince) is a way more interesting than the first one since Elizabeth has the chance to express a myriad of emotions, which makes the character more captivating and appealing. We get to see her pissed off, even more than that time with Errinwright. What is even more satisfying is that in the end Anna is actually able to stop Clarissa Mao, while after she succeeded to incriminate Errinwright, she found out that Sorento-Gillis was even worse. Her last scene in the episode is totally unexpected and now Anna is finally on the Roci, which means Elizabeth is finally able to interact with the main cast (at least part of it) even if it’s just for the last 2 episodes. I have to admit a growing admiration for our space minister Anna Volovodov. When Melba made her escape via space to get onto the Rocinante, I thought the shot of Anna screaming at Melba through the air-lock was kind of the end of it. But dear Anna showed she’s got some fire in the belly by following Melba to the Roci and saving Naomi’s life while in Melba’s death grip. Great to see Amos and Alex still alive — bruised and bloodied, but alive — and to see Naomi back home where she belongs (Amos, nice little line about changing her hair. Again, subtle humor that resonates so effectively), but to see Anna’s passion and commitment to justice being done on Melba was something special. I’m sure Anna hasn’t done much space walking, but it’s also fairly obvious that when she puts her mind to something (and that something was Melba), she will not easily be dissuaded. So now she’s aboard the Rocinante, Melba got a nice dose of shock therapy, and Naomi will try to put the pieces together. I think Anna will be an interesting part of the Rocinante crew dynamics moving forward, provided she stays aboard for a while — and I think she will. This section of story is really well done, with all three of the main actors involved doing a great job. Clarissa/Melba is a complex character and here shows both determination, and single minded obsession, but also a vulnerability and desperation, as she looks to get away. Alongside this, Tilly, who was clearly trying to make a change for the better, essentially gets punished for her efforts, and gets skewered during the deceleration, but holds out long enough to tell Anna (Elizabeth Mitchell) of who Melba really is. Having been asleep during the deceleration, Anna is uninjured and tries to help the crew, which includes Melba, who has broken her arm. Later, after she discovers the mortally wounded Tilly and learns the truth about Melba, she goes after her, seemingly still trying to save her. 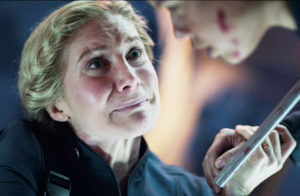 Elizabeth Mitchell is especially brilliant during this whole episode, as she has to portray a variety of emotional states, and conflicting thoughts, showing the grief, panic, and strive for justice at various points. Beside the enthusiasm (of the woman who does the podcasts) about Anna being such a badass yesterday, there’s nothing really important in this podcast. Anyway here’s the part about Liz’s character.